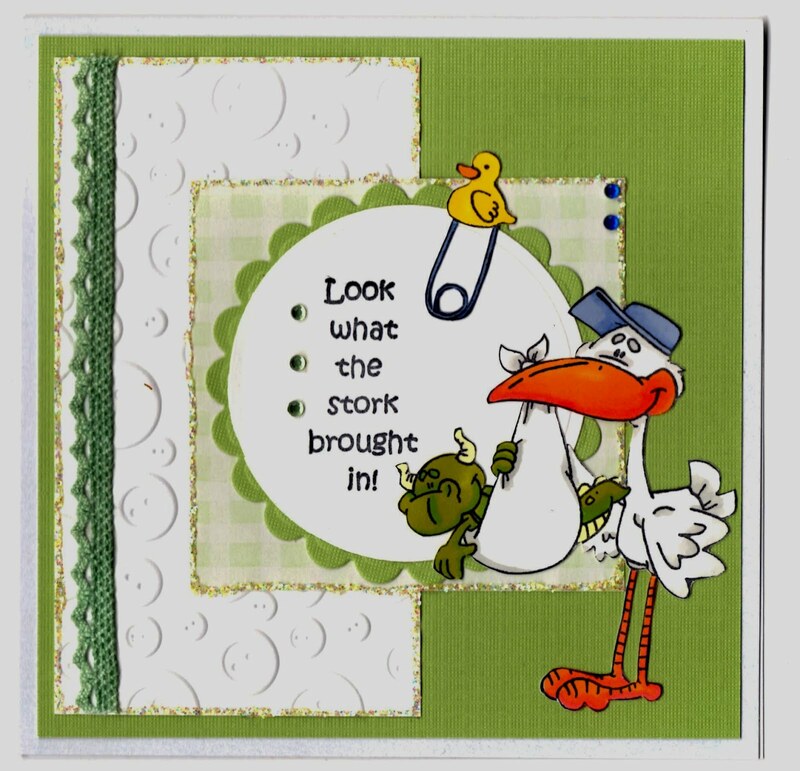 Lorraine's creations: Look What The Stork Brought In! I hope you like it and have a wonderful sunday. I like the new design for your blog - very good indeed. The colouring of your stork is lovely with the soft shades of grey adding dimension & really 'popping' against the orange - what a glorious beak & I like how those little blue gems pick out the colour of his hat. What a darling baby card = so cute with stork and the saying. Love it. Thanks for joining us this week at the Stamptacular Sunday Challenge. Fabulous creation sweetie...and have a lovely evening too..
Great card really fun design thanks fro joining us at PanPastel Uk this week. Gorgeous card sweetie, love the papers. What a lovely card Lorraine, so amazing! Thanks for joining us at Secret Crafter Saturday Challenge this week, hugs, Franz. Wow this is such a smiley card, it is super. Love the image of the stork that makes it such a happy card . Have looked around your blog you have made some great creations. Gorgeous card Lorraine,love the image and sentiment,congrats on winning it. I adore that card Lorraine! What a fabulous Stamp to have in your Stash! Hi, thanks for joining in with the Desmet Designs challenge. Good luck! A gorgeous card Lorraine, love the image and embossed buttons. Oh Lorraine this is so cute and absolutely gorgeous I love that image and what a great sentiment, the colours and design are just perfect. Ahhh so cute. Thanks for joining us at Crafts and Me. I also have candy on my blog HERE. That is one cute image! Bright and fun card! Thanks for joining us at DYSU. Well done on your CD win Lorraine. Will be watching to see what you make with your too. "SNAP"
Beautiful card and love the image. Thank you for joining us at Desmet Designs Challenge this month. Fab Card ! !Thanks for playing at High Hopes Challenges ! !Hope to see you again ! !